It’s fall here in the Northern Hemisphere. That means cooling temperatures, leaves falling from the trees, scrumptious dishes featuring apples and pumpkin, and – unfortunately – the dreaded cold virus. I’m just getting over my first cold of the season, and my body’s been craving more tea than usual. Especially herbals. Anything with chamomile, spearmint, or lemongrass is my best friend right now. Which means it’s the perfect time to introduce you to Inspired By Jane, which offers a line of five teas that pay tribute of the works of Jane Austen. (Yay, more literary-themed teas!) Three of its teas include herbal ingredients, and one of those offerings is Pemberley, a blend of green tea with lemongrass and lavender. Sounds like it might tickle your tastebuds? Then read on! For anyone who’s wondering, Pemberley is the name of Mr. Darcy’s countryside estate in Pride and Prejudice. After rejecting Mr. Darcy’s first marriage proposal, Elizabeth Bennet visits Pemberley and falls in love with its natural beauty – and realizes she’s falling for Mr. Darcy, too. Inspired By Jane’s Description: “PEMBERLEY: the grand country estate of Mr. Darcy in Pride and Prejudice, where Elizabeth finally starts to realize the goodness and complexity of his true character. Steeping Instructions: Use 1 teabag per 8 oz of water. Heat water to boiling (212 degrees Fahrenheit / 100 degrees Celsius) and steep for 1 to 3 minutes. I have to comment on Pemberley’s packaging first – because it’s beautiful! The vintage artwork on the canister really looks like a scene from a Jane Austen novel. The tea sachets are of high quality: silken, triangular, and large enough to allow the leaves and herbs to plump up while brewing. This excites me even before I’ve steeped my first cup. And the scent of Pemberley. Ohhhhhhhhhh… As soon as I open the canister, the soothing floral perfume of lavender drifts out to greet me. A bright undercurrent of lemongrass also peeks through. I don’t smell much of the green tea, but based on what I see in the sachet, the herbal ingredients seem to be more plentiful and will therefore be more prevalent scent-wise. That’s OK with me, though. I love what I smell here, and I’m eager to get this a-brewing. My first cup of Pemberley steeps in boiling water for about 2 minutes. The infusion turns a light golden yellow and lilts with the sweet scent of lemongrass and lavender. When I take my first sip, the tea is cotton-soft on my tongue, and the flavor palette evens out. There’s the freshness of green tea, the uplifting citrus of lemongrass, and subtle floral notes from the lavender. Imagine a morning in your flower garden, the feeling of relaxation as you breathe in the mingling fragrances, and the tiny bursts of joy at seeing brightly colored buds ready to bloom. That’s what Pemberley tastes like. No wonder I want a second cup right away! I intended on giving Steep #2 about 3 minutes. But without a proper timer at work, I accidentally lost track of time and let it go for almost 5 minutes. Despite my mistake, this second cup of Pemberley doesn’t taste overbrewed. It’s still smooth and delicate, with a darker golden yellow color and a more pronounced grassy flavor with floral undertones. No bitterness or astringency is present, and its bouquet still reminds me of late April and early May in Massachusetts. Most green teas (even those with herbal additives) don’t taste this delightful when they steep for too long, so this is a lovely surprise. I think Pemberley from Inspired By Jane has charmed me the way that its namesake charmed Elizabeth Bennet! Its blend of lemongrass, lavender, and green tea results in a fragrant, pastoral infusion that’s both comforting and refreshing, just like springtime. Some tea drinkers might find Pemberley too floral for their tastes, but I savored every sip. And with silken sachets and subsequent brews that are just as pleasing as the first, this is one of the highest quality bagged teas you’ll find anywhere. Possible Book Pairings: Besides Pride and Prejudice, Pemberley makes a dainty companion with Kristin Hannah’s The Nightingale, Juliet Marillier’s Daughter of the Forest, Naomi Novik’s Uprooted, or any novel that prevalently features countryside settings or gardens. 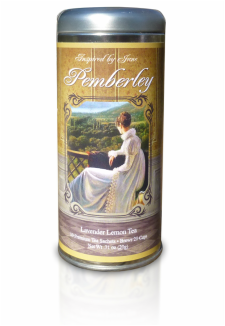 You can purchase Pemberley Green & Herbal Tea directly from Inspired By Jane here. Next Post Review of Robert Galbraith’s (JK Rowling’s) Cuckoo’s Calling: Cormoran Strike Detective Series. It’s tea review time again! And if you’re a fan of herbal tisanes and literary-themed teas, this one might tickle your tastebuds. 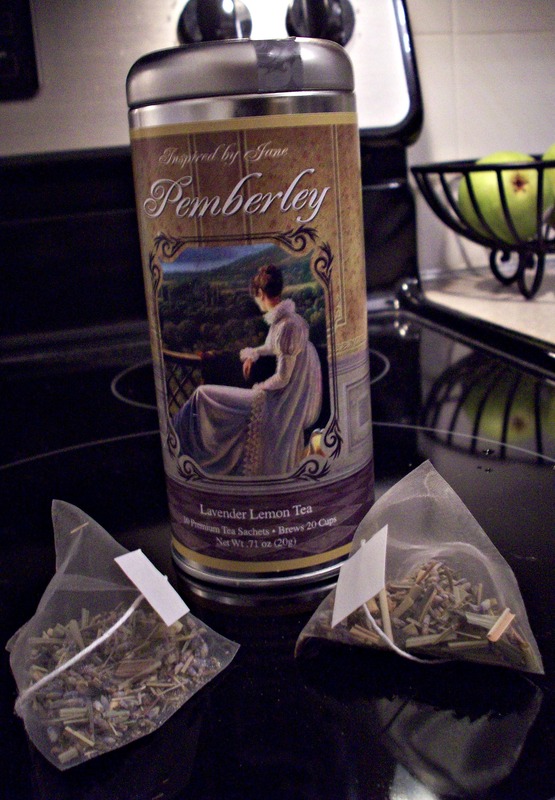 Head over to A Bibliophile’s Reverie to learn more about Pemberley Green & Herbal Tea from Inspired By Jane – and find out why the timing for this particular review was impeccable from a health perspective. This tea sounds so yummy! ^ ^ I adore floral teas and I love teas based on a place or character.